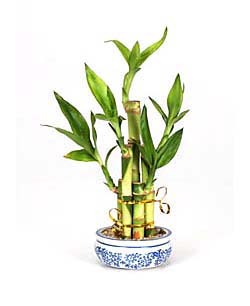 Bamboo, is very a tough and resilient plant that does not need direct sun light. It can grow in places where sun light is not available, like hallways or bathrooms. It is very easy to take care of, just add or replace water once a week. The Chinese buy Bamboo to celebrate a business grand opening, the purchase of a new home, or just for pure luck! Bamboo is one of the plants recommended by Feng Shui masters to improve Feng Shui and create a space where you feel safe and more energized. An ideal balance to our high-pressured world! Bamboo has been treated and cultivated under natural growing conditions according to Feng Shui methodology, therefore, their energies are more powerful. 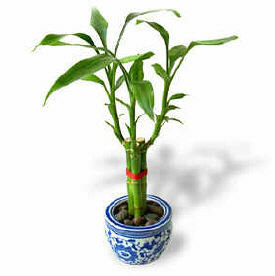 Environment: bamboo is an easy-to-grow plant should be keep indoors. In shallow water of between 1/2 - 1" is ideal, in a small vase or other container without drainage holes. Place it in a location with bright, indirect light. bamboo grows 1-3" every year. Irrigation: Check the water level frequently (about once a week or so) and add water as needed to keep a the water level at 1/2 - 1". To keep the water clean, change it once a month. To discourage fungal disease, never allow water to touch the tip of the plant. 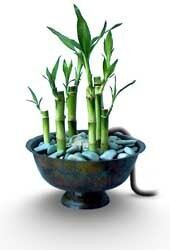 Fertilizer: Is not necessary to feed bamboo.